Galway (; Irish: Gaillimh, [ˈɡalʲɪvʲ]) is a city in the West of Ireland in the province of Connacht. Galway City Council is the local authority for the city. Galway lies on the River Corrib between Lough Corrib and Galway Bay and is surrounded by County Galway. It is the fourth most populous urban area in the Republic of Ireland and the sixth most populous city in the island of Ireland. According to the 2016 Irish Census, Galway city has a population of 79,504; however, the rural county agglomeration is far more populous. The city's name is from the Irish name for Gaillimhe ("Galway"), which formed the western boundary of the earliest settlement, Dún na Gaillimhe "Fort Gaillimh". (Mythical and alternative derivations of the name are given in History of Galway). Historically, the name was Anglicised as Galliv, which is closer to the Irish pronunciation as is the city's name in Latin, Galvia. The city also bears the nickname "The City of the Tribes" (Irish: Cathair na dTreabh) because of the fourteen merchant families called the "tribes of Galway" led the city in its Hiberno-Norman period. Residents of the city refer to themselves as "Galwegians". Dún Bhun na Gaillimhe ("Fort at the Mouth (bottom) of the Gaillimh") was constructed in 1124, by the King of Connacht, Tairrdelbach Ua Conchobair (1088–1156). Eventually, a small settlement grew up around this fort. During the Norman invasion of Connacht in the 1230s, Galway fort was captured by Richard Mor de Burgh, who had led the invasion. As the de Burghs eventually became Gaelicised, the merchants of the town, the Tribes of Galway, pushed for greater control over the walled city. In common with many ancient European sea ports, the patron saint of the city (since the 14th century) is St Nicholas of Myra. 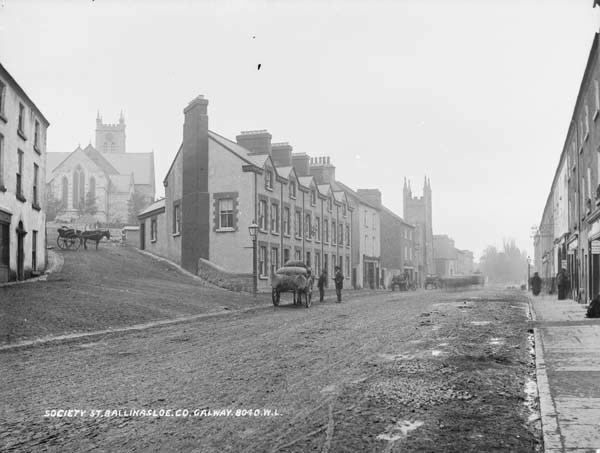 The Roman Catholic diocese of Galway was created in 1831 AD following the abolition by the Holy See of the Wardenship of Galway. It was united with the diocese of Kilmacduagh (est. 1152 AD) and given the administratorship of the diocese of Kilfenora (est. 1152 AD) in 1883. Its full name is the Diocese of Galway, Kilmacduagh and Apostolic Administratorship of Kilfenora (in Irish - Deoise na Gaillimhe, Chill Mac Duach agus Riarachán Aspalda Cill Fhionnúrach, in Latin - Diocesis Galviensis, Duacensis ac Administratio Apostolica Finaborensis). The diocese is under the patronage Our Lady Assumed into Heaven and St Nicholas (Galway), Saint Fachanan (Kilmacduagh) and St Colman (Kilfenora). As the diocese of Kilfenora is in the Ecclesiastical Metropolitan Province of Cashel the Bishop of Galway is its Apostolic Administrator rather than its bishop. The dioceses of Galway and Kilmacduagh are in the Ecclesiastical Metropolitan Province of Tuam. The current bishop is Most Rev. Martin Drennan, installed 3 July 2005. Of the 38 parishes in the RC diocese 14 are situated in the City and are divide into two deaneries - the deanery of Galway City West and of Galway City East. In each deanery a Vicar Forane exercises limited jurisdiction on behalf of the bishop. With a population of 75,529, Galway is the fourth most populous city in the State and the 23rd most populous area of local government. Services such as waste collection, recycling, traffic control, parks and housing are controlled by a fifteen-member city council elected to five-year terms by proportional representation through means of the Single Transferable Vote PR-STV. The City Council is chaired by a mayor who is elected to a one-year term by fellow councillors. The role of mayor is mainly ceremonial, although they do have the casting vote. The first mayor was Peirce Lynch Fitzjohn, elected in 1485. Cllr. Frank Fahy was elected Mayor in June 2015. President of Ireland Michael D. Higgins was TD for the Galway West parliamentary constituency, of which Galway City is a part, from 1981 to 1982 and from 1987 to 2011. He was also Mayor of Galway for two terms, 1981–82 and 1990-91. The highest honour the city can bestow is the Freedom of the City. Among the names on the Roll of Honour are: Douglas Hyde, President of Ireland, 1939; Eamonn de Valera, Taoiseach, 1946; Sean T O'Kelly, President of Ireland, 1950; Robert F. Wagner, Mayor of New York, 1961; John F. Kennedy, President of the US, 1963; Pope John Paul II, 1979; Ronald Reagan, President of the US, 1984; Hillary Clinton, 1999; Richard M. Daley, Mayor of Chicago, 2003; Nelson Mandela, 2003; Aung San Suu Kyi, Burmese activist/leader, 2005; Garry Hynes, Druid Theatre Founder, 2006; and Michael D. Higgins, President of Ireland, 2012. The original quadrangle building of National University of Ireland, Galway which was erected in 1849 (during the Great Famine or An Gorta Mór) as one of the three colleges of the Queen's University of Ireland (along with Queen's University Belfast and University College Cork). The university holds the UNESCO archive of spoken material for the Celtic languages. The Galway City Museum features two parts, "Fragments of a City" and "On Reflection." "Fragments of a City"'s collection is mainly about the heritage of Galway, while "On Reflection" is a collection of the most important Irish artists from the second half of the 20th century. This museum was designed to allow tourists and local visitors to really get to understand and know the city of Galway. This museum also houses the statue of the poet, Pádraic Ó Conaire which was originally located in the Kennedy Park section of Eyre Square, prior to the Square's renovation. Visitors can also view the silver Civic Sword and Great Mace of the city at the museum. The museum is part of the Spanish Arch, the historical remnants of the 16th century wall that helped protect Galway. Fort Hill Cemetery, on Lough Athalia Road, is the oldest cemetery still in use in Galway City. Inside the main gate is a memorial to sailors of the Spanish Armada who were buried here in the 1580s. There are several smaller cemeteries within the city boundaries. Some are no longer in use or are used primarily by families with ancient burial rights. These are St James's Cemetery (Teampall) in Glenina Heights, Menlo Cemetery near Menlo Castle, Ballybrit Graveyard near the entrance to Galway Racecourse, and a very ancient early Christian graveyard at Roscam near Merlin Park. Several city churches have graveyards attached which were formerly used for the interment of clergy and parishioners - Castlegar Church, Claddagh Church', St Patrick's Church on Forster Street and St. Nicholas' Collegiate Church. Several bishops are buried in the crypt below the RC Cathedral but this not usually open to the public. 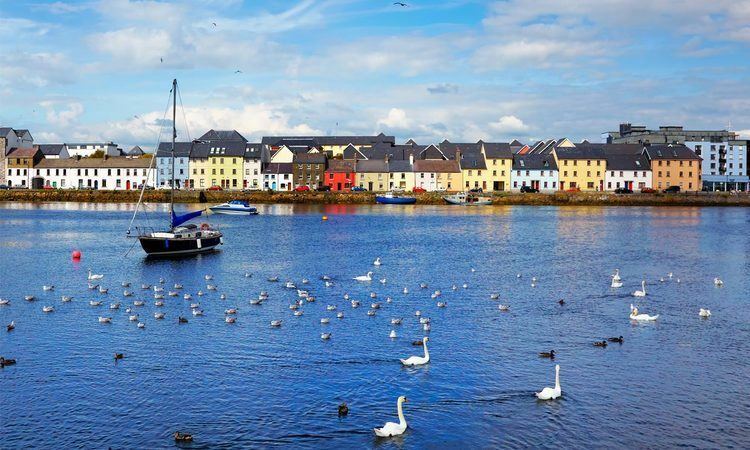 Galway is known as Ireland's Cultural Heart (Croí Cultúrtha na hÉireann) and is renowned for its vibrant lifestyle and numerous festivals, celebrations and events. Every November, Galway hosts the Tulca Festival of Visual Arts as well as numerous festivals. Among the poets currently writing in Galway are Fred Johnston, Patrick Deeley, Rita Ann Higgins, Mary O'Malley, Moya Cannon, Eva Bourke, Kevin Higgins, Ndrek Gjini, Elaine Feeney. Walter Macken, Eilís Dillon, Máirtín Ó Direáin, Máirtín Ó Cadhain, Liam O'Flaherty, Pádraic Ó Conaire and Ken Bruen are well-known writers in both English and Irish with a connection to Galway. The writer and publisher Frank Harris was born in Galway. Walter Macken's novel Rain on the Wind is set in the city as are the "Jack Taylor" crime novels of Ken Bruen. Galway has a permanent Irish language theatre located in the city centre, Taibhdhearc na Gaillimhe (1928), which has produced some of Ireland's most celebrated actors. The Druid Theatre Company has won international acclaim for its cutting edge production and direction. There are many theatres in the city including Nun's Island Theatre, The Bank of Ireland Theatre, The Druid Lane Theatre, The Black Box Theatre and The Town Hall Theatre, a modern art theatre with two performance spaces opened in 1995 that has a 52-week program covering all aspects of the performing arts including ballets, musicals and operas. It has been the venue for many Irish film premieres, during the Galway Film Fleadh. Two of the most celebrated Irish actors of the 20th century, Siobhán McKenna and Peter O'Toole, have strong family connections with Galway. Other well-known actors include Mick Lally, Seán McGinley and Marie Mullen, all three of whom were founders of the Druid Theatre Company. Other actors with strong Galway connections are Pauline McLynn, (Shameless and Father Ted), Nora Jane Noone and Aoife Mulholland. Galway has a vibrant and varied musical scene. As in most Irish cities traditional music is popular and is kept alive in pubs and by street performers. Galway Early Music Festival presents European music from the 12th to the 18th century. It encourages not only music, but also dance and costumes. The festival involves both professional and amateur musicians. A number of notable choirs are based in the city. They include Tribal Chamber Choir (founded in 2009) directed by Mark Keane; the Galway Baroque Singers (founded in 1983) directed by Audrey Corbett; Cois Cladaigh Chamber Choir (founded in 1982) directed by Brendan O'Connor, which sang at the inauguration of President Michael D. Higgins in St Patrick's Hall, Dublin Castle, on 11 November 2011; Galway Gospel Choir (founded in 2001) directed By Michel Durham Brandt; and Galway Choral Association (founded in 1998) directed by Norman Duffy. In addition to its parish choir the Collegiate Church of St Nicholas is home to two other choral groups, the Choral Scholars (adult) and the Schola Cantorum (juvenile). Galway has three cinema complexes within easy reach of the city centre. The 11 screen IMC cinema is across the road from the Galway Shopping Centre, Headford Road. The 9 screen EYE cinema, is at Wellpark, Dublin Road. There is a six-screen IMC complex in Oranmore. Galway is home to the Galway Film Fleadh, Ireland's foremost film festival, which takes place over six days each July. The Galway Film Fleadh is a platform for international cinema in Ireland and an advocate for Irish national cinema, for which the festival's identity has become synonymous. The Galway Film Fleadh is an industry festival, with many industry events taking place under the name of the Galway Film Fair, including conferences, screenings, masterclasses, networking events, Ireland’s longest-running Pitching Competition and Ireland’s only film marketplace. Many sporting, music, arts and other events take place in the city. 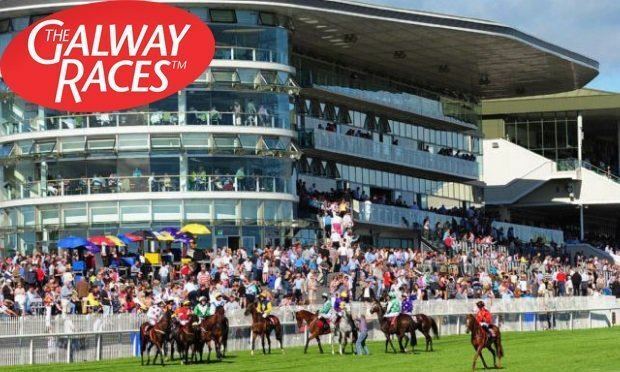 The largest of these annual events begins with the Galway Film Fleadh and the Galway Arts Festival in July, the Galway Races in August, and the Galway International Oyster Festival in September. Other events include the Fleadh Imboilg, the Baboró International Children's Festival, the Cúirt International Festival of Literature, the Galway Early Music Festival, Seachtain na Gaeilge (March), Salthill Air Show (June), the Colours Fringe Festival, Little Havana Festival, the Galway Sessions, Galway Garden Festival, Galway Comedy Festival, Baffle Poetry Festival, Galway Aboo Halloween Festival, Tulca Festival of Visual Arts, Galway Science and Technology Festival, Spirit of Voice Festival, Galway Christmas Market, Galway African Film Festival and Galway Pride Festival. Each year in November, Galway hosts The Irish Fly Fair and Angling Show, this Fly Fishing Event brings together Fly Dressers, Fly Casters and Fishing Celebrities from many different countries, to show of their craft. There are only two radio stations based in the city – Galway Bay FM (95.8 FM) broadcasts from the city to the whole county; Flirt FM (101.3 FM) the student radio station for NUIG. One of the main regional newspapers for the county is The Connacht Tribune which prints two titles every week, the Connacht Tribune on Thursday, and the Galway City Tribune on Friday. As of January 2007, The Tribune has a weekly readership of over 150,000. Another Galway-based newspaper is the Galway Advertiser, a free paper printed every Thursday with an average of 160 pages and a circulation of 70,000 copies. It is the main paper of the Advertiser Newspaper Group which distributes 200,000 newspapers per and more week to a variety of other Irish cities and towns. Another free paper, the Galway Independent, prints on a Tuesday night for Wednesday circulation. Preliminary information from the 2011 census shows Galway City has a population of 75,414, and increase of 3,000 over the 2006 census figures. Based in the 2006 census, the population of Galway City and its environs was 72,729, of which 72,414 lived in the city limits and 315 live in the city's environs in County Galway. If the current growth rate continues, the population of the city will hit 100,000 by 2020. Galway City is the fourth largest in the Republic of Ireland, and sixth on the island of Ireland. Approximately 80% of the population of Galway is white Irish, descended from native Gaelic peoples and Norman settlers. A further 2.9% are Black Irish. Following an influx of immigrants to Galway during the 2000s, approximately 20% of the population is non-Irish. Slightly more than half of this group (11.3%) are white Europeans, coming from Poland and other Central European and Baltic States, such as Latvia and Lithuania. Smaller numbers of Asian and African immigrants come from East Africa, Nigeria, Zimbabwe and Sri Lanka. In the 2006 Census, 15.4% of the population were aged 0–14, 76.1% were aged 15–64, and 8.5% were aged over 65. 51.9% of the population were female and 48.1% were male. Buses are the main form of public transport in the city and county. There are fifteen routes in the city operated by Bus Éireann and City Direct . From Galway railway services along the Western Rail Corridor link the city with Ennis, and Limerick where trains run to Cork via Limerick Junction (for Tipperary, Clonmel and Waterford) and Mallow (for Kilarney and Tralee). Three national primary roads serve the city: the N17 connecting the Northwest (Tuam, Sligo, Donegal Town, Letterkenny and Derry), the M6 motorway running East/West (Athlone, Dublin), and the M18 motorway linking Galway to Southern towns and cities (Ennis, Shannon Town, Limerick and Cork). As of 2015 works are underway to extend the M18 northwards to link to the M6. When completed, the M17/M18 will reduce journey times between Limerick and Galway, allowing the two cities to work more closely together. In addition, there are plans for a semi-ring road of the city, the Galway City Outer Bypass. There is also an Inner City Ring (Cuar Inmheánach) route that encircles the city centre, most of which is pedestrianised. In 2002, there were 27 primary schools and 11 secondary schools in Galway. National University of Ireland, Galway (NUIG) was founded in 1845 as Queen's College, Galway, and was more recently known as University College, Galway (U.C.G.). It is divided into several colleges including the College of Arts, Social Science and Celtic Studies, the College Medicine, Nursing and Health Sciences, the College of Business, Public Policy and Law, the College of Science and the College of Engineering and Informatics. The university has an enrollment of 16000 (2010). The Biomedical Research Building was opened in 2014. It houses the Regenerative Medicine Institute (REMEDI). Also opened in 2014 were the Hardiman Building and a new School of Psychology. The Hardiman Building is home to the university's collection of more than 350 literary, theatrical, political and historical archives. The building houses also the Moore Institute for Research in the Humanities and Social Sciences and the Whitaker Institute for Innovation and Societal Change. The National Institute of Preventive Cardiology is an affiliate of NUIG. Two private hospitals, The Galway Clinic and the Bon Secours Hospital, Galway, also operate in the city. Galway Hospice provides palliative care for the people of Galway City and County on a homecare, inpatient and daycare basis. Both hurling and football are strong in Galway city. Pearse Stadium in Salthill is the home to Galway GAA, the county's Gaelic games body. The Galway hurlers compete annually in the All-Ireland Senior Hurling Championship for the Liam MacCarthy Cup. Despite having won the cup only 4 times in their history, Galway is considered as one of the top teams in the Championship. Galway reached the 2012 All-Ireland final only to draw with Kilkenny to force a replay, the first since 1959, which they eventually lost. The footballers compete annually in the All-Ireland Senior Football Championship for the Sam Maguire Cup. The footballers have won the cup 9 times with the most recent being in 2001. The team participate in the Pro12 League competition, and in season 2015-2016 won their inaugural Championship by defeating reigning Champions Glasgow Warriors in the Semi-final and then beating four times champions Leinster Rugby in the Grand Final on 28 May 2016 played at Murrayfield Stadium. The team will participate in European Rugby Champions Cup 2016/2017. Several golf courses serve Galway city. Bearna Golf Club, Galway Golf Club, Cregmore Golf Club and Galway Bay Golf Resort are all situated within 8 kilometres (5 mi) of the city centre. Sailing on both sea and lake are popular, as is rowing in the River Corrib with seven clubs providing the necessary facilities and organising rowing competitions. These clubs include: Gráinne Mhaol Rowing Club, Tribesmen Rowing Club, Galway Rowing Club, Coláiste Iognáid ('The Jes') Rowing Club, St. Joseph's Patrician College ('The Bish') Rowing Club, NUIG Boat Club and Cumann Rámhaiochta Choláiste na Coiribe.